With the incredibly low cost of software defined radio (SDR) hardware, and the often zero cost of related software, there’s never been a better time to get into the world of radio. If you’ve got $30 burning a hole in your pocket, you’re good to go. But as with any engrossing hobby that’s cheap to get into, you run the risk of going overboard eventually. For example, if the radio gear inside your car approaches parity with the Kelly Blue Book value of said vehicle, you may have been bitten by the radio bug. 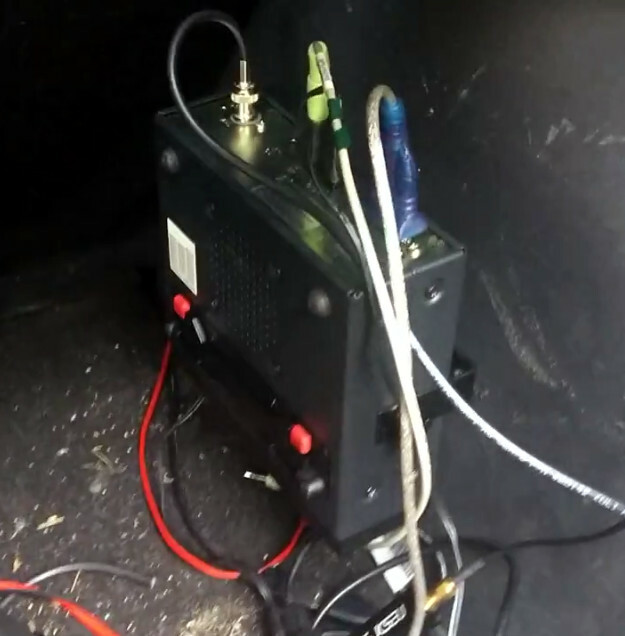 In the video after the break, [Corrosive] gives us a tour of his antenna festooned Hyundai Accent, that features everything he needs to receive and analyze a multitude of analog and digital radio signals on the go. He starts with the roof of the car, which is home to five whip antennas (not counting the one from the factory installed AM/FM radio) and two GPS receivers. The ones on the rear of the car feed down into the trunk, where a bank of Nooelec NESDR RTL-SDR receivers will live in a USB hub. He’s only got one installed for test purposes, but he’ll need more for everything he’s got planned. Also riding in the back is a BCD780XLT scanner, which he got cheap on eBay thanks to the fact it had a dead display. Luckily, where [Corrosive] is going, he won’t need displays. The SDR receivers and the scanner are all controlled from the driver’s seat by way of a Windows 10 tablet. This runs the ProScan software that provides a virtual interface to the BCD780XLT, as well as various SDR interfaces. He’s also got Gpredict for tracking satellites and ADS-B programs like Virtual Radar. The car’s head unit has been replaced by a rooted Android entertainment system which supports USB host mode. [Corrosive] says it isn’t hooked up yet, but in the future the head unit is going to get its own SDR receiver so he can run programs like RF Analyzer right in the dashboard. We’re willing to bet that this will be the only car in the world that has both a waterfall display and the “Check Engine” light on at the same time. Even if you aren’t ready to install it in your car, you might like to read up on using multiple SDR receivers for trunked radio or setting up your own ADS-B receiver to get a better idea of what [Corrosive] has in mind once everything is up and running. Reminds me of a buddy of mine who works for a cellular company. The car was decked out. I work for a Motorola shop, haven’t play much with Cellular but I’ve been in many of the carriers towers. Fun stuff! I have a friend who manages roof tops in Atlanta (building owners / management outsource that sort of thing). I’ve been on top of many of the buildings in Atlanta, and there is indeed some cool stuff. Generally the cellular providers have their own locked rooms that we can’t get into, but a lot of the trunking equipment, amateur repeaters, commercial radio systems, NSA (or some other TLA, I can’t remember) monitoring posts, WiFi repeaters, AM and FM broadcast transmitters. It’s fun stuff. I was searching the web a few days back and found an image of the Carnivore interface online (I haven’t gotten into that stuff since like back at Tech) and see now they are using more commercially available software called “NarusInsight”. Neat mobile system. Thanks for sharing. Interesting seeing the Android and Windows 10 apps with the hardware. You can put passive, and I guess active if there isn’t RFI/EMI, heat sinks on your SDR’s to keep them cooler also. Old video cards are neat sources for cheap sinks and components. A directional antenna like a tape measure yagi or parabolic dish/trough might be handy for pinpointing if you’re into RDF. Touchtone is kind of interesting with the RTL-SDR’s and I like RF Explorer. Spektrum is also an interesting app for viewing a larger range (I still want to expand the range for the HackRF in the future). If you’re into correlating sound also or lower frequencies with either pressure or RF studies, Spectrum Lab is an interesting application I like using. I like Xirrus Wi-Fi Inspector and inSSIDer for WiFi, though Kali Linux is the LiveCD OS with all the tools. I haven’t used Radio-Sky Spectrograph yet, though want to one of these days. I’m interested to see what others recommend for radio. I haven’t gotten around to yet, though did want to look into using a laser microphone as a laser antenna. Can be interesting to determine the best laser frequency to use based on materials needed to be penetrated like compared to the laser absorption, reflection and transmission of those materials needed to be penetrated. I’ve also wanted to play around with florescent lamps as plasma antennas. Seems interesting also for something to do with CFL’s or even smaller florescent tubes. Hope you have a garage to keep that mobile in. You stand out for grand theft auto. Came out of CVS the other night…. Some guy in the parking lot was basically trying to phase his head through the glass..
Was in there for only a minute, he was so intently looking in he didn’t see me until I was right next to him. Looked over and just walked away without saying a word.